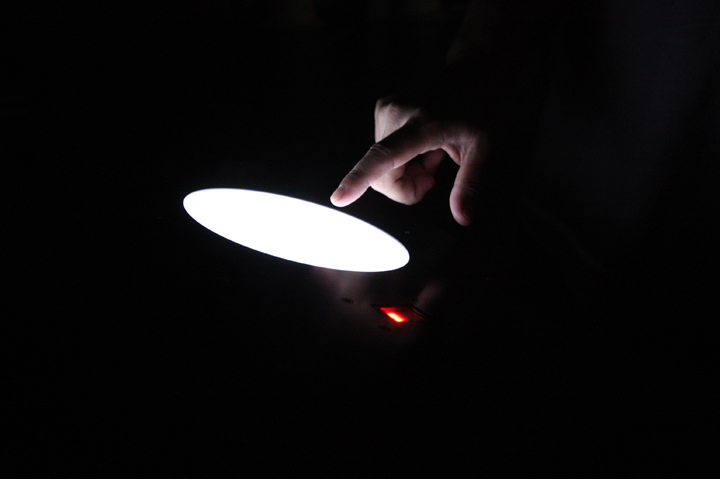 Digiti Sonus is an interactive fingerprint sonification or interactive sound installation that transforms human's fingerprints into musical sound. 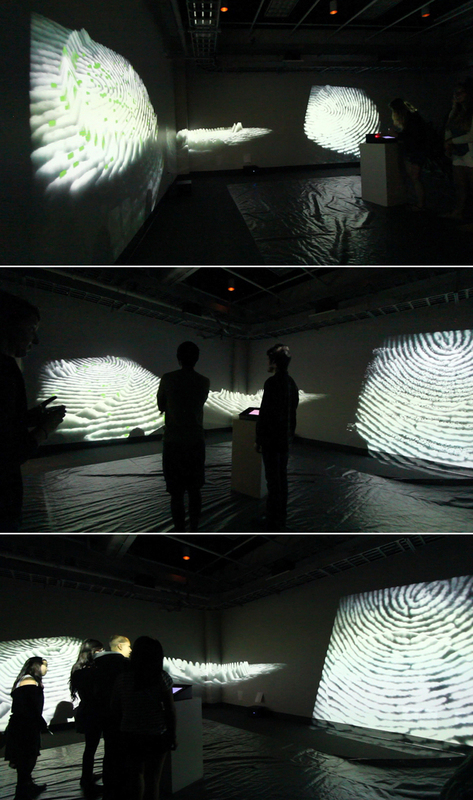 The idea is to allow audience to explore their own identities through unique sound generated by their fingerprint patterns based on algorithmic computing and a physical device. The captured sound is looped and harmonized with other fingerprint sound so that the result is a real time experimental music as a representation of intergrated human identities and societal communication. Every biologic organism has a unique body pattern. Among all the patterns, fingerprints are the most unique visual patterns in human and primates' bodies. There are only few graphical line patterns in human body such as wrinkles of hand, elbow, and knee, and palm lines. Rather than the others, fingerprints are the only clearly recognizable patterns that can be manipulated and saved into large amount of database. Because of the clarity and uniqueness, fingerprints have been widely used for personal identification. In this digital era, many computer machines and digital interfaces use fingerprints as secure keys and access to identify personal information. Fingerprint identification is one of the most significant biometric technology which has drawn a substantial amount of attention. I believe fingerprints are the most intuitive and powerful resource to represent individual's pure voice and identity. There is no trick or filter on the fingerprint patterns. Only the simple, spiral pattern stays in the truth of human birth, genes, and growth. The beginning of human birth and natural naming of body itself are contained in this simple and tiny pattern at the end of fingers, the hidden body part. Thus, fingerprint is a great resource not only for finding societal identities, but for exploring our inner, unconscious, and pure voice in our bodies. 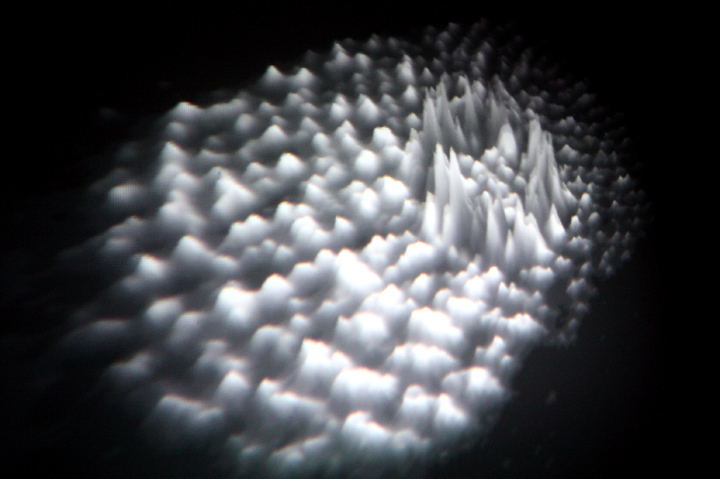 My recent works have been exploring interesting results of transformation from natural patterns to sound in digital platform. One of the previous examples is "Tree Rings," which investigates the comparison between the naturally generated tree ring patterns and artificially generated sound tree rings; I captured urban soundscape and transformed the waveform into spiral form. Both tree rings show their different history, time, and space in spiral timeline shapes. Fingerprint is the next project of my on-going sound pattern series. "Digiti Sonus" will effectively deliver my artistic context on the sonic pattern and identity. “손끝소리”는 지문을 소리화하여 인간의 아이덴티티를 탐구하는 인터렉티브 사운드 설치작품이다. 지문은 우리 몸에서 자연스럽게 형성된 독특한 자연적 신분증이며, 이는 우리의 선천적 아이덴티티를 결정짓는 중요한 단서이다. 이 신비로운 자연의 패턴은 단순히 신분을 판별하는 목적이외에 우리 내면의 목소리를 표출하는 도구로 사용될 수 있다. “손끝소리”는 자신은 모르는 자신만의 숨겨진, 그리고 고유한 표식인 지문을 이용해 소리 아이덴티티를 탐색한다. 지문 패턴은 일종의 소리의 악보로 변환되어 새로운 변이 과정을 모색하며 자신의 몸에서 비롯된 지문음악을 창조할 수 있다. “손끝소리”는 지문센서를 이용하여 관람객의 지문을 읽어들이고, 실시간으로 그 지문의 형태를 분석하고 3D로 변환한다. 지문의 골의 높낮이에 따라 오디오 주파수값이 변화되고, 지문을 통한 음악재생의 시작점은 터치스크린으로 선택할 수 있다. 지문센서 옆에 위치한 원형의 터치스크린을 터치하면 그 부분에 해당되는 3D 지문이미지가 파형을 그리며 주변으로 퍼지고, 그에 해당되는 주파수값과 진폭이 변화하며 소리가 재생된다. 또한, 지문의 융기점의 갯수와 위치값도 특정 주파수로 변환되어 재생된다. 무한한 가능성의 개수와 조합을 갖고 있는 지문의 소리화와 그 미묘한 변화. 그 모든 것의 시작점과 마침점 또한 관람객의 존재이다. 관람객의 몸은 하나의 음원이자 소리매개체이며, 작곡자이자 지휘자가 되며 소리를 조절한다. 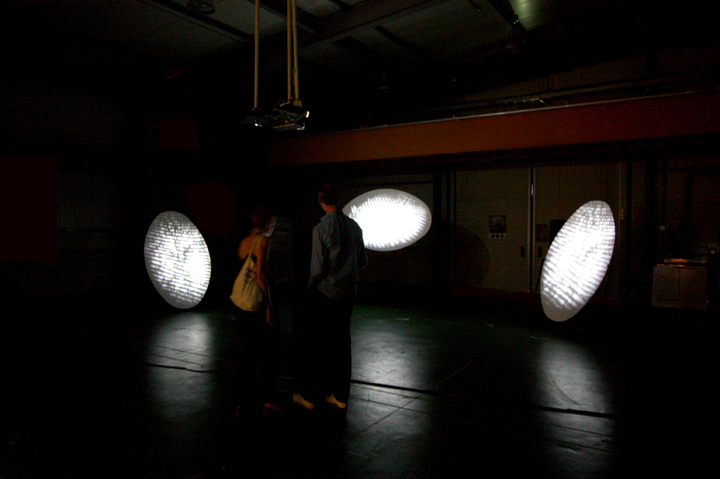 This work is the result of DaVinci Media art project 2012 which is supported by Seoul Art Space and Geumcheon art space. 본 작품은 서울시 창작공간과 금천예술공장의 지원을 받은 2012년 다빈치 미디어 아트 아이디어의 결과물입니다.